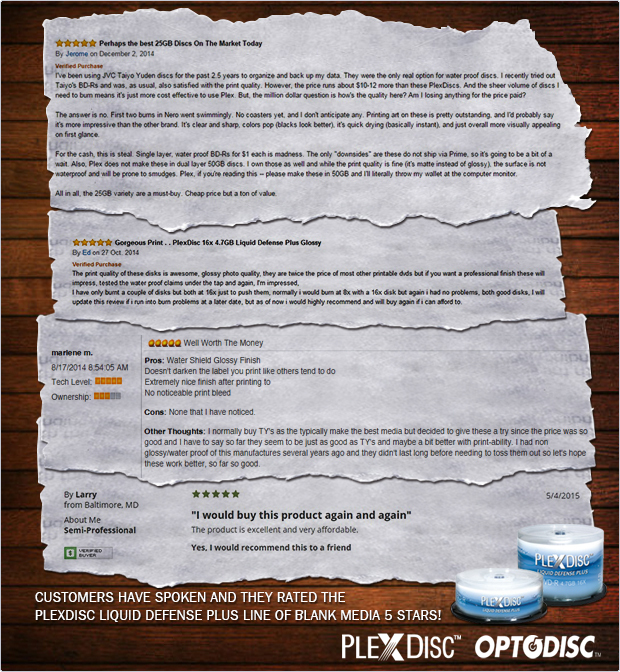 Customers have spoken and they rated the PlexDisc Liquid Defense Plus line of blank media 5 stars! When it comes to recordable optical disc media, there are a lot of choices on the market, but how do you know which one will give you the quality and performance that youâ€™re looking for? The same way we make decisions on nearly everything we buy, check the reviews from others that have purchased and used that product. The PlexDisc Liquid Defense Plus line of water and scratch resistant glossy white inkjet printable media, manufactured by Optodisc under Vinpowerâ€™s stick guidelines, has received rave reviews and clients have been very happy with the print and burn quality. The product line has received excellent ratings and remarks all over the world including in Japan, the U.S.A, Canada, UK, Germany, Singapore, Thailand, Taiwan, China, South Africa, Australia and many other locations. With Taiyo Yuden/JVC leaving the market, it leaves a large void in the professional market for reliable quality blank media. Optodisc, which includes the PlexDisc line, was developed with the Taiyo Yuden concept in mind. As a manufacturer of duplication hardware for over 15 years, Vinpower has a great understanding about recordable media and how it needs to hold up under the rigors and fast pace of the duplication market. So regardless of whether customers need an inkjet or thermal printable surface or require a reflective silver lacquer finish, Optodisc has what they need across all formats, including CD-R, DVDÂ±R, DVDÂ±R DL, BD-R, and BD-R DL. With offices in the Americas, Europe, China, and Taiwan, Vinpower can provide quick fulfillment, support, or advice anywhere in the world. For more details about the PlexDisc Liquid Defense Plus or any of the other lines of Optodisc media, visit www.vinpowerdigital.com or contact a Vinpower representative near you. 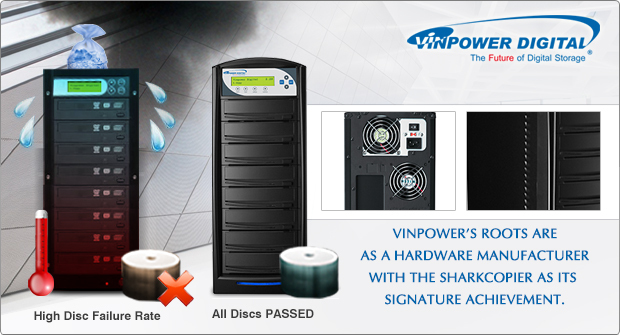 Vinpowerâ€™s roots are as a hardware manufacturer with the SharkCopier as its signature achievement. When Vinpower started in 2000, there were already a number of established duplicator manufacturers and suppliers, but Vinpower was determined to make its mark amongst them. However, with minimal funding and a lot of tenacity and determination under its wing, Vinpower set out to make a signature product that would define them and set them apart from the other manual tower suppliers on the market. Thatâ€™s when we created the patented SharkCopier series of manual tower duplicators. This line was developed with inspiration from luxury European cars like BMW and Mercedes in which both visual beauty and high performance blended to make exceptional products. The SharkCopierâ€™s aluminum frame served as a stylish departure from the standard boxy clone cases, but also offered a method to disperse heat far faster and efficiently allowing the SharkCopier to operate continuously without negative repercussions from overheating like traditional steel cases. It was a serious gamble to develop a new line of manual tower duplicator cases in a niche market with little to no guarantee that the massive investment would pay off. However, the SharkCopier line has proven to be a success and is a symbol of prosperity for a company that started with little more than $3,000 and a dream to become a market leader who continues to grow and make advancements in the field of digital duplication hardware and media. To learn more about Vinpower Digitalâ€™s full line of duplication hardware or its market leading recordable media, visit our website: www.vinpowerdigital.com, or speak with a Vinpower representative today. 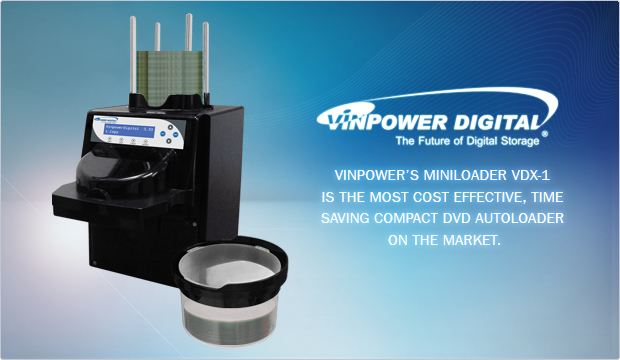 Vinpowerâ€™s MiniLoader VDX-1 is the most cost effective, time saving compact DVD autoloader on the market. Vinpower has long been known as an innovator in the field of optical disc duplication, especially with our market leading autoloader duplicators. However, there is also value in acquiring an existing product, improving it, and giving customers a reliable, highly efficient reboot for a new DVD autoloader at a very low price. Vinpower acquired the rights, designs and material of the Dexpreso Company, which manufactured the DEX1000 automatic CD/DVD burner. Overall, this system was a decent loader and was adopted by a number of brands in the market. However, it had its flaws and never became as popular as it could have been. When Dexpreso decided to close its doors, Vinpower recognized the merits of the tiny loader and acquired all rights. After modifying the mechanics and implementing our own burning software, the new VDX-1 CD/DVD/Blu-ray Autoloader is now available and better than ever. With an extremely aggressive price point and a light portable frame, the VDX-1 is sure to be a hit amongst light to medium duplicators that would benefit from an automated device but couldnâ€™t justify the expense. The VDX-1 is priced comparably to a small manual tower duplicator, but its 50 disc capacity autoloader mechanism, allows the user to focus on other pressing projects. For more details about the VDX-1 or to find out how to offer or purchase this system, go to www.vinpowerdigital.com or contact a Vinpower representative near you.